HomeWomen in Touch Members – SCV April Meeting – Visitors Welcome! 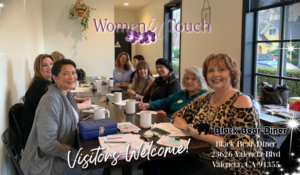 Women in Touch Members – SCV April Meeting – Visitors Welcome! This meeting is designed to help Women in Touch Members achieve personal or professional goals by being accountable and learning more about how we can work together! We are excited to move our event to the new Black Bear Diner. The members meeting is short and focused group, we appreciate if you could arrive on time and be ready start by 9am sharp!